During the week at IMHX Doosan will be hosting live entertainment n the stand from Ian Cook, owner of PopBangColour, a contemporary British artist internationally known for his unique methods, who has featured on television shows such as The One Show, Top Gear and Blue Peter. Ian paintings are produced in a unique form creating artwork solely using the method of radio-controlled cars, car tyres and toy car wheels as paintbrushes. 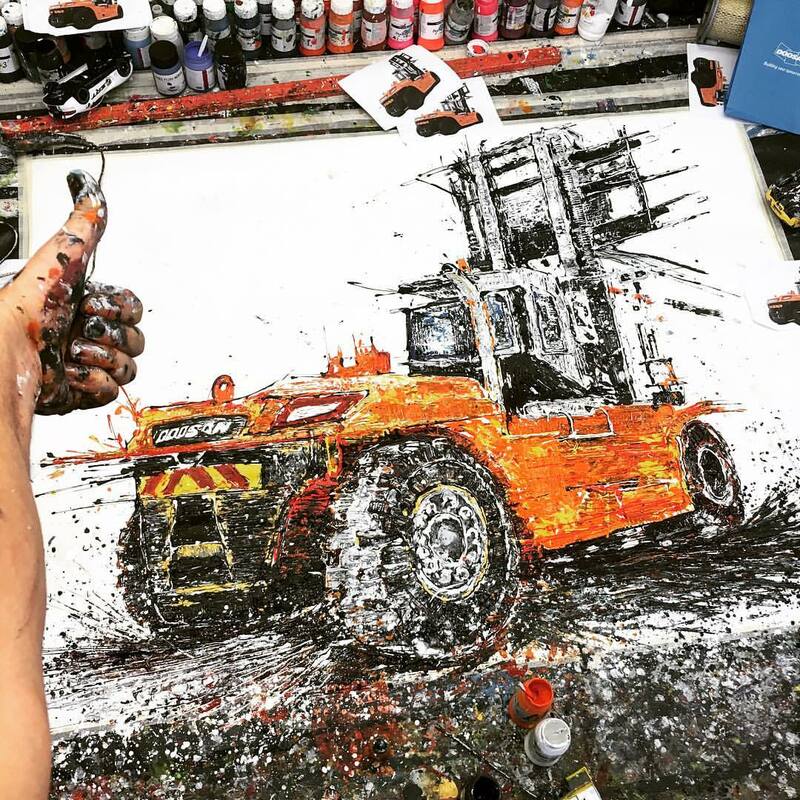 Each day at IMHX Ian will be producing a different painting of a Doosan forklift truck, using radio-controlled cars and Doosan forklift parts. This week, Ian produced his first piece of artwork of a Doosan forklift truck. Check out Ian on Facebook, Twitter or his Flickr page for more images. Visitors will be able to watch Ian perform live at IMHX and be in with a chance of winning pieces of art work. Doosan will be exhibiting a vast range of new and improved products at IMHX. Showcasing 16 trucks live on the stand, the new 25 tonne and 80 volt 4 wheel electric trucks will be unveiled with product introductions and demonstrations taking place throughout the week. This provides visitors with the chance to experience the latest forklift truck innovations first hand. For the latest solutions to all your materials handling needs, visit the Doosan stand 11P61 at the IMHX Exhibition, 13 – 16 September at the Birmingham NEC.